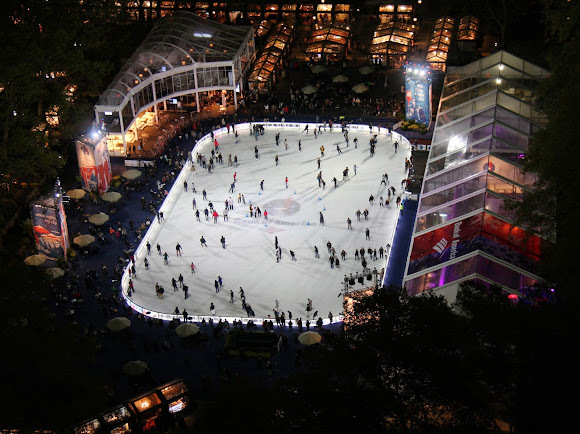 Each year we try to improve on the previous year's Bank of America Winter Village, from Winter Village events, to the variety presented at the Holiday Shops, to the physical design of the space. The new dasher boards are especially striking at night. This year, one of the eye-opening changes can be seen in the dasher boards, the railings around the rink. Last year Bryant Park's in-house design team redesigned them to have a cleaner, simpler design with smooth, ergonomic handrails that are easy to grab onto at any age. The dasher boards are at the right height--most people can see over them. And even if you can't see over them, you can see through them! Building on those improvements, this year's dasher boards feature a two-layer design with LED lighting. Each board has two light bars, top and bottom, that illuminate the dasher boards from within. The LEDs’ lenses are optimized to provide the right wash of light as evenly as possible inside the board. Day or night, the LEDs inside the dasher boards optimize light on the Rink. The Winter Village illuminated dasher boards project is a collaboration between three entities. Bryant Park Corporation initiated the project and provided graphic, product design, and product development via their in-house design department. Green Ray LED Lighting, a Connecticut-based LED manufacturer, developed the LED technology and electrical design. Becker Arena Products, a Minnesota-based rink product provider, engineered and manufactured the Dasher Boards. Before the LED installation, previous iterations of The Rink suffered from shadows at the edges, where the dasher boards met the ice. 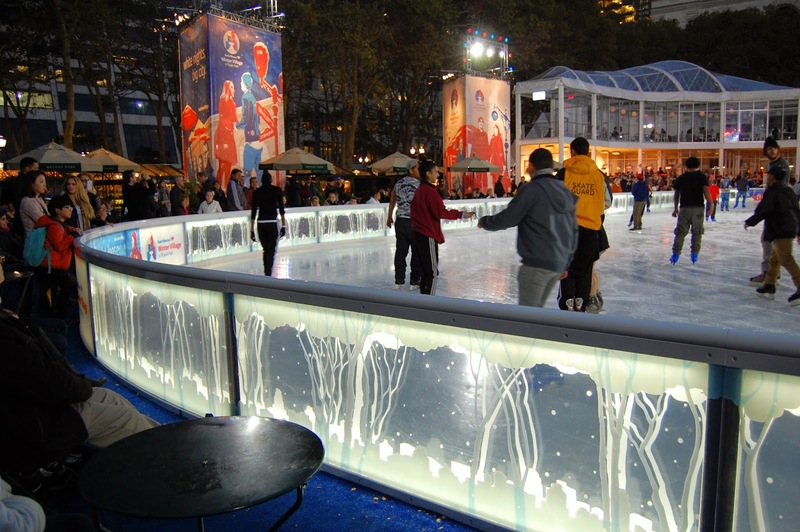 The illuminated dasher boards brighten the entire perimeter, providing a safer skating experience. The new dasher boards illuminate the ice better. The LEDs illuminate lightbox-type graphics for our sponsors and partners, as well as a tree landscape graphic that takes full advantage of the lighting effect. The dasher boards create a sense of wonder for young and old. In the boards with the tree graphic, we kept much of each board clear so that you could see the layers of graphic and light. 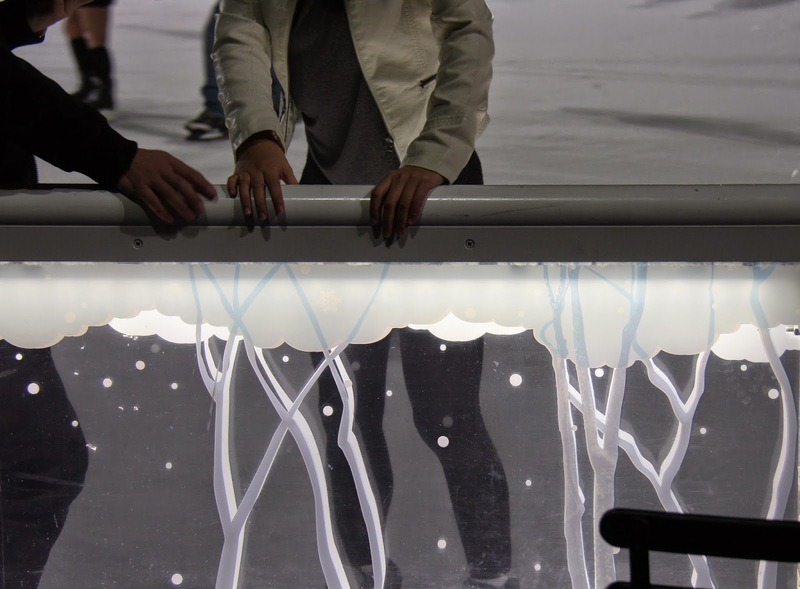 The glow in between the boards creates a three dimensional effect, becoming almost like a diorama: of cityscape, our iconic London Plane trees, snow, and clouds, and of course, skaters! Now park patrons can do what they love best (second to skating and shopping)— skater-watching. 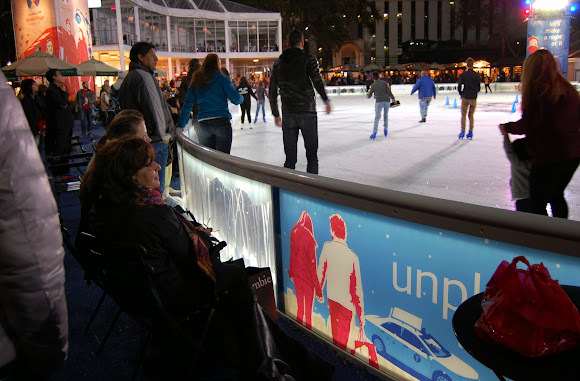 Many parkgoers pull our movable chairs up to the edge of the boards to be close to the skaters, and it is now more of a delight than ever. We invite you to check out these dasher boards for yourself!